The Magnetic Dipole Field 3D Model displays the field lines and field vectors of a dipole located at the origin and oriented along the z-axis. Users can compute the field line passing through a point by dragging the a marker within the 3D view. Users can also visualize the field vectors in a plane passing though the center of the dipole. The Magnetic Dipole Field 3D Model was developed using the Easy Java Simulations (Ejs) modeling tool. It is distributed as a ready-to-run (compiled) Java archive. Double clicking the ejs_em_MagneticDipole3D.jar file will run the program if Java is installed. EJS is a part of the Open Source Physics Project and is designed to make it easier to access, modify, and generate computer models. Please note that this resource requires at least version 1.6 of Java (JRE). The source code zip archive contains an XML representation of the EJS Falling Body on Magnetic Dipole Field 3D Model. Unzip this archive in your EJS workspace to compile and run this model using EJS. W. Christian, Computer Program MAGNETIC DIPOLE FIELD 3D MODEL, Version 1.0 (2012), WWW Document, (https://www.compadre.org/Repository/document/ServeFile.cfm?ID=12361&DocID=3083). 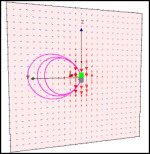 W. Christian, Computer Program MAGNETIC DIPOLE FIELD 3D MODEL, Version 1.0 (2012), <https://www.compadre.org/Repository/document/ServeFile.cfm?ID=12361&DocID=3083>. Christian, Wolfgang. "Magnetic Dipole Field 3D Model." Version 1.0. https://www.compadre.org/Repository/document/ServeFile.cfm?ID=12361&DocID=3083 (accessed 24 April 2019). Christian, Wolfgang. Magnetic Dipole Field 3D Model. Vers. 1.0. Computer software. 2012. Java (JRE) 1.6. 24 Apr. 2019 <https://www.compadre.org/Repository/document/ServeFile.cfm?ID=12361&DocID=3083>. The Easy Java Simulations Modeling and Authoring Tool is needed to explore the computational model used in the Magnetic Dipole Field 3D Model.